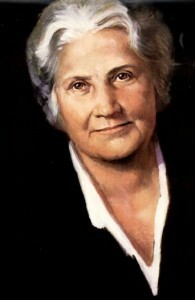 Maria Montessori (1870-1952), known throughout the world as the originator of the Montessori Method of Education, was the first woman in Italy to receive a medical degree. In 1902, while working with children with mental or emotional disabilities, she was inspired to design a variety of learning materials which proved very successful with these handicapped children. Her opportunity to have these materials used by a larger and more diverse group of children came in 1907 when she was asked to direct a pre-school project for socially disadvantaged children in the San Lorenzo district of Rome. Her Casa dei Bambini or Children’s House became world famous, and educational observers came from many different countries to watch the young children absorbed in learning with these unusual materials. In the United States, a resurgence of interest in the Montessori Method began in 1960 and led to the establishment of thousands of new Montessori schools.